I have this motto - go hard or go home. And since I'm not one to disappoint, I'm going quite hard with these Julep Maven boxes! For those that are new to these subscription boxes, Julep's main focus is offering manicure and pedicure centred products. There are about 5 differently styles that you can "choose" from. The one thing about this particular box is that they let you preview it before they send it to you, so if you don't like the items in your "style" box for that month, you can switch it up for another style's box! In addition, you can purchase past boxes. And of course, that's what I've done! This is March's Boho Glam box. It came with three items (and lots of chocolates!!! ): Alicia, Portia and Julep Elixir Organic Moroccan Argan Oil. Alicia is a sunny salmon creme. When I think of salmon, I think of pink undertones, but this one has more...orange undertones. It's a beautiful shade, but it's a little darker on than what you see in the picture (and it's pretty close to what you see in the bottle). Portia is a sheer tropical blue with glittery sparkles. The sparkles aren't fine, but rather middle of the road chunky. It also doesn't spread evenly very well and you can definitely tell that the base is blue. I also don't find the glitter to be glittery enough - and I'm not even a huge glitter fan! It's pretty though. 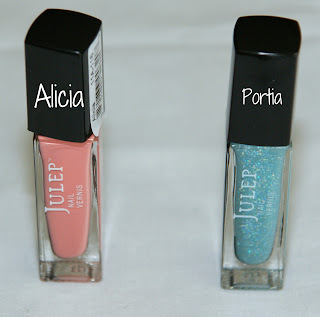 I find that Julep nail polishes are thick, but you need at least three coats, which to me, is a little weird...but as I was swatching Alicia (which I adore!) on my nail wheel, it only took one coat! Yay for one coat laziness! To be honest, I've been obsessed with the colour orange lately. Not the super bright orange, but the beautiful peaches, corals and salmon shades...so I pretty much got this box for that shade because it's just simply perfect! It's Tuesday night, do you know where your BLOGHOP is??? Alicia is one of my favourite polishes! I swatched it in one of my blog posts and I loved it so much that I kept it on for a few more days! It's such a beautiful salmon colour. All the more reason to pick it up!!! It really is a beautiful colour! Alicia looks and sounds lovely! Portia, not so much! Where are the chocolates? om nom nom! What pretty colors! I've been thinking about trying the Julep box. Maybe the next time they have a coupon code or other special I'll try it out! I am in love with these two colors. Jealous! Thanks for the visit, following you now.